Documentary film directed and produced by Deeyah through Fuuse Films about the so called honour killing of Banaz Mahmod wins the 2013 Emmy for Best International Documentary Film. Banaz film directed by Deeyah and produced by Fuuse Films receives the 2013 Royal Television Society (RTS) Journalism Award Nomination for UK Home Current Affairs documentary film. A reversioned edit of Banaz A Love Story will be Broadcast on ITV1 in the UK this Wednesday (October 31st) at 10.35pm. Legendary guitarist John McLaughlin meets with Norwegian music producer, Deeyah. On his official website he has written a blog in support of the album and artists on “Listen To The Banned”. 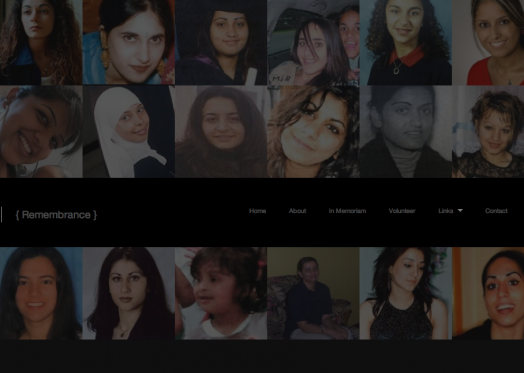 HBVA (Honour Based Violence Awareness network) is an international digital resource centre working to advance understanding and awareness of Honour Killings and Honour Based Violence through research, training and information for professionals; teachers, health workers, social services, police, politicians, and others who may encounter individuals at risk. Deeyah, Annie Lennox, Tori Amos, Tim McGraw and Christina Aguilera are among The Pixel Project’s 2012 list of 10 Music Artistes Who Support The Cause To End Violence Against Women. One of India’s leading national newspapers, “The Hindu Times” published an article about Memini the digital initiative founded by Deeyah in remembrance of victims of honour killings worldwide. 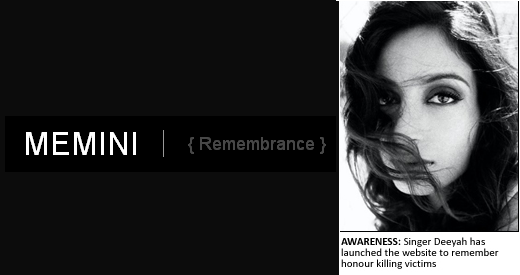 MEMINI, an online site of remembrance for victims of Honour Killings got featured in England’s ‘The Asian Today’ newspaper. Click to read the full article. In this interview with “A safe world for women” Deeyah talks to Chris Crowstaff about how her music and activism have come together, as a result of her own experiences. In this interview with Care2.com, Deeyah speaks about the great importance of organizations like Freemuse.